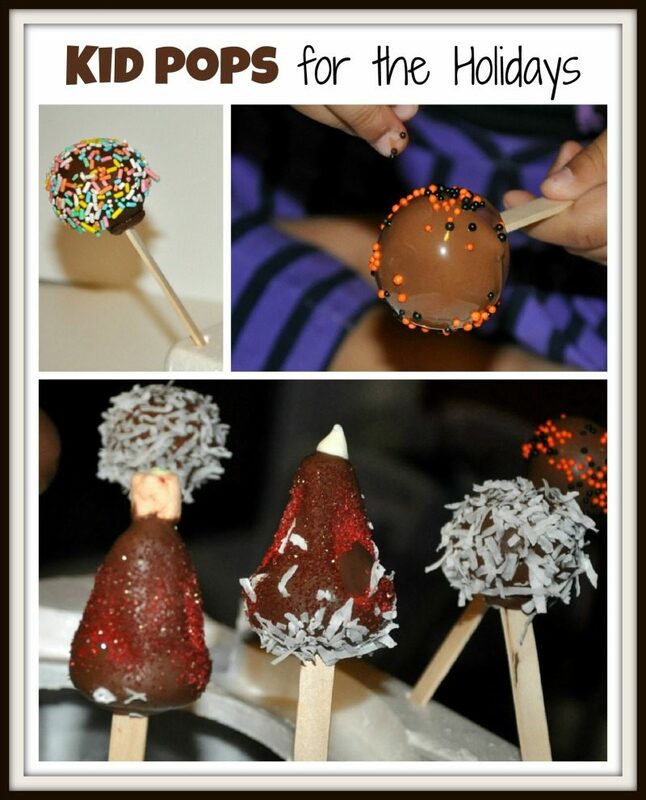 Holiday Baking with Kids – Cake pops ! Christmas brings families across the country together. In our house, the kids wait for their cousins and the adults are excited about the lil’ nieces and nephews..and I’m the Aunt who does “fun stuff”…fearlessly bakes cakes, cookies and pies ! This holiday season we are going to be making Cake pops. Its become a phenomenon , kids and adults alike. Cake pops is the new favorite and the possibilities of crafting, endless. Thanks to the boxed cake mixes and can frosting….Yes I do take a shortcut, because I don’t want to be measuring and pouring flour and cleaning clouds of flour dust and not to mention washing all the dishes in my kitchen on a holiday specially when I have company. A shortcut sometimes is the best route to go! You can find real good gourmet ones or Pillsbury or Betty crocker will do just good too. Or if you prefer to do your own family recipe for the cake, you sure can ! Here is the process in easy steps. Before I begin, a few facts : Baking is all about measures and measurements. A boxed cake will make TWO 8-inch round cakes . I have used only ONE 8-inch round. It yields approximately 12 – 15 cake pops. You can freeze up the other for upto 3 months. Just tightly wrap it with a food wrap and pop it in the freezer for another day. Crumble the cake. You can use your food processor and pulse to get fine crumbles or do it by hand, cut it in to halves and just rub the cake against each other. Add frosting, you will need a 1/4th cup for an 8 inch round. Mix well. Hands are your best tools , make sure the kids have clean hands before they start and mix it all well. 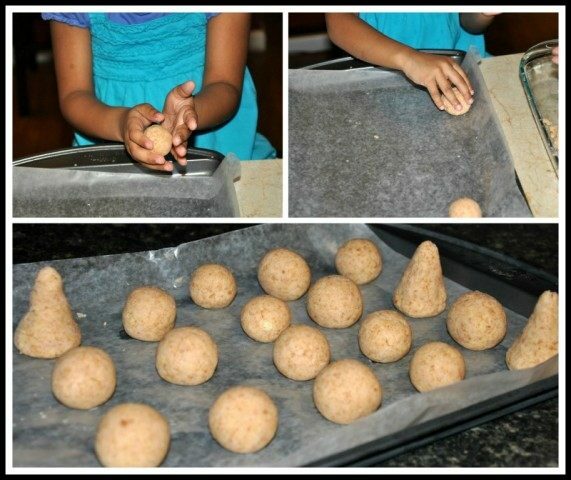 Scoop up a tablespoon and make into balls or we tried making Santa’s hats; place them on a parchment lined cookie tray. Pop them into the freezer for 5 minutes. In the meanwhile, melt a few candy melts in the microwave. 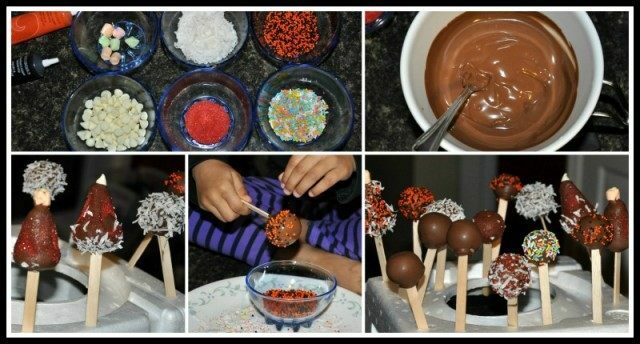 Pull the pops out, dip the craft stick or pop stick in to the candy melt and stick them into the cake pop. YOU HAVE TO DO THIS STEP . It helps the cake pops stick to the pop stick. Put them back in the freezer for 20 minutes to firm up well. Melt the remaining candy melts and set your decorations ready. Dip the cake pops into the candy melt , do not stir it around. Gently tap off the excess coating and add your sprinkles or funfetti and place it on a Styrofoam block to dry. That’s it. Now who wouldn’t want to eat that??? Enjoy making Fun pops this holiday season and remember to have fun with it. Looks like a fun and yummy activity! Thank you for sharing at Sharing Saturday!